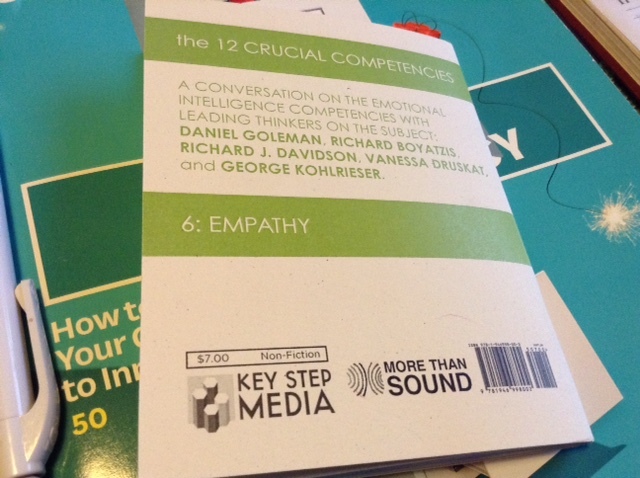 As readers of this newsletter, and of my separate blog will know, I have been making my way through Daniel Goleman et al’s twelve Building Blocks of Emotional Intelligence. I had the sixth one, on empathy, all lined up to read when I came across The Problem with Empathy, shared by one of my connections on LinkedIn. The gist of the post is that we should be careful about getting onto the bandwagon of what is trendy in the management world, and make sure that we do not get so absorbed in the emotions associated with empathy as to lose our critical thinking. The author also suggested that the term ‘compassion’ might be a more appropriate one to use. I still believe, based on RiverRhee’s recent and ongoing experiences in working with our clients that, whatever we call it, empathy is still (as I described it in a previous post) a “magical leadership ingredient”. Daniel Goleman and his co-authors have some excellent insights to share with us on this topic, and so it seems like a fitting one on which to focus in RiverRhee’s last newsletter for 2018. 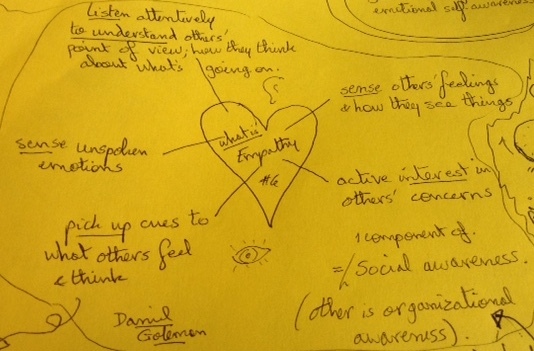 According to Goleman et al, empathy is one of the two components of social awareness. (The other is organisational awareness, which I have written about previously). It is about tuning into what others are thinking and feeling. Empathy also, as everyone seems to agree, combines both cognitive (or intellectual) understanding and emotional understanding. In fact, different parts of the brain are involved in each of these. The key, as both Richard J Davidson and Vanessa Druskat explain, is to be able to turn this empathy, or compassion, from caring into action. Most importantly: leaders and team members who are able to balance empathy with constructive feedback will be far more effective than those who are simply able to relate to others’ emotions. Why is empathy so important? Empathy is about showing the other person that they have been heard and understood. Knowing that you care about them could help the other person feel more motivated. And having this level of insight will help you to communicate with and work with the other person in a way that will be more effective. Illustration based on #6: Empathy in Building Blocks of Emotional Intelligence. Explained in these terms, empathy really does seem to be a key ingredient for all the important activities and situations that arise in our day-to-day interactions with others. For line and project managers, leaders, and team members empathy could make all the difference in terms of being able to influence, motivate, mentor and inspire. It should help with managing conflict, collaborating in teams, and working across cultures. How to develop your ability to be empathetic? Goleman suggests that we are more likely to be good at being empathetic if we have strong emotional self-awareness. We can also “widen our circle of compassion”, as Richard J. Davidson suggests, by taking the same level of interest in our co-workers, as we take for our family and friends. And we can actively listen to them when in one-to-one discussions, or in meetings, rather than writing notes or looking at our electronic devices. George Kohlrieser takes this a step further. He suggests that we could learn to open up to our own and others’ emotions (if we are not already doing so). Apparently he asks leaders in his workshops to create a timeline of their lives that include five of the most painful, and five of the most positive of their experiences. He then has them tell each other the story of one of these. Whether or not you agree with this level of revelation, there is something to reflect upon here in terms of what makes a leader come across as more authentic, credible or trustworthy, and better able to tune into and act upon their understanding of others. Performance Reviews & Appraisals (for supervisors and line managers). Tuesday 15th January. Note that this is a half-day course: 13:00 – 16:30. It reflects the content of RiverRhee’s management module on Performance Management and Development and emphasises the two-way nature of this topic. Introduction to Management. Tuesday 29th to Thursday 31st January (FULL); also Tuesday 12th to Thursday 14th March. RiverRhee’s flagship course for new managers and those who are more experienced but have never had any formal training. Transition to Leadership. Tuesday 5th February. This one-day course is targeted at managers who have attended RiverRhee’s 3-day course, and those who have recently moved to, or are planning to move to a more senior leadership role. Assertiveness. Tuesday 5th March. This is one of RiverRhee’s newer courses to complement their courses and modules on Effective Influencing and Communication, and on Dealing with Difficult Situations. * Please enquire for dates in 2019. All of RiverRhee’s courses can be scheduled on demand, either to run in-house for your company, or to publicise as an open course for other delegates. We can also explore most topics in one-to-one coaching sessions. Do get in touch if you would like to find out more about RiverRhee, and how we can help you to create exceptional managers and teams. See the RiverRhee Consulting website or e-mail the author at elisabeth@riverrhee.com or contact Elisabeth on 07876 130 817. Francesca Gino’s article on “The business case for curiosity”, in the September-October issue of Harvard Business Review (pp. 48-57) is my source of inspiration for this issue of our bi-monthly newsletter. The newsletter also includes details of our remaining scheduled courses for 2018, and some early plans for 2019. Francesca Gino’s article has lots of great fact and data from surveys and studies and case studies – which make the article a fascinating read should anyone wish to take a look for themselves. I’ve pulled out the conclusions under three main headings: how curiosity leads to better performance, the barriers that can get in the way of curiosity, and how to encourage greater curiosity at work. Curiosity in practice equates to an interest in new ideas, learning and development, continuous improvement, creativity and innovation. And so a leader can do much to create a culture of greater curiosity at work. A manager or leader who asks questions. listens to and acknowledges what others have to say will demonstrate what it is to be curious. This, rather than telling, is likely to lead to trust and respect from others. It’s OK to not know the answer, especially if that is followed-up with a desire to find out and learn from others. Key performance indicators are important drivers of performance, but so is the opportunity to learn and be creative. If individuals and organisations are focused solely on meeting deadlines, there will be little scope for reflection, exploration and innovation. Francesca Gino quotes Ford’s and Toyota’s approaches to process improvement and one of the principles that we teach is that it should be used to free up people’s time for reflection and creativity. Dan Pink also emphasises the importance of giving people time to explore to satisfy their motivational need for autonomy and mastery. (See Motivation – a refresher… eight years on..) Some organisations go as far as giving people a periodic creativity day when they can do this. Or they pay for learning and development opportunities that might be outside the immediate scope of the employees current role. Listen to the questions that the candidate asks – especially if these go beyond questions on the immediate role – as another indicator of curiosity. The ‘5 Why’s’ that we teach in our Lean and Six Sigma training echoes one of Francesca Gino’s recommendations. We also teach managers on our management training courses the value of asking open questions to promote the sharing of ideas by their direct reports. “How could we?” is a great way of engaging people in finding ways to address problems – and one that Ludo Chapman of The Innovation Practice use in a recent strategy and team building event that I co-facilitated with him. We know that people learn and explore in different ways. Some people do so more through individual research and reflection, others do so through their interactions with others. Francesca Gino puts more emphasis on the latter: giving people the opportunity to network with others, creating collaborative working spaces, promoting cross-training. We also believe that people need the opportunity for individual reflection, and encourage our delegates to find creative ways of scheduling such opportunities into their agendas. We like to build our bi-monthly newsletters around specific themes, inspired by recent events, or subjects we have come across. Why is adaptability so important? As Goleman points out in his introduction to the subject, adaptability is the strongest predictor of an individual’s success in life and in their career (whatever the definition of success might be). Apparently, adaptability tops all of the other 11 emotional or social competencies defined in the series for this effect. We have been truly impressed by the quality of delegates that we have been getting on our training courses in recent months, and the extent to which they have demonstrated adaptability. We encourage our delegates to develop action plans at the end of the courses. These plans often demonstrate in-depth personal reflection and include intentions to adapt their behaviours and working practices. Where we’ve had the opportunity to carry out follow-up coaching, the individuals have implemented the plans with very good results for themselves, their direct reports and their teams. Adaptability is also an important competence for operational and project teams. As Vanessa Druskat describes in her chapter on “Team and Adaptability”, change is a constant factor for teams. They need to be nimble and respond to changes in remit and timelines if they are to be successful. Druskat suggests that the highest performing teams regularly assess and update what they are doing in terms of their goals, plans and working practices. Team diagnostic tools can help with this and feature in our Management courses and Team Development workshops. We also put a strong focus on proactive behaviours such as risk management in our Project Management courses, and problem solving techniques in our Introduction to Lean and Six Sigma. All of these are approaches will help teams’ adaptability. Adaptability is also a condition for innovation. As Richard Boyatzis points out, in his chapter on “Adaptability and Leadership”, a leader can influence a team’s ability to innovate by being open to new ideas – not only in how they respond to suggestions from the team, but also by actively eliciting ideas from the team. The illustration above is a handy description of adaptability. Adaptability is about how one responds to change and uncertainty, how one innovates – whilst still being focused on the end goal. Boyatzis has a useful addition to this. He says adaptability is about being able to alter your thinking, approach and feelings to a response that is more useful or effective. He also contrasts adaptability with rigidity. Individuals, teams, organisations, nations etc. that demonstrate rigidity will often find themselves in power struggles. The outcome of these struggles will be win / lose situations and unresolvable conflict. However, Boyatzis also suggests that people might also want to retain a certain amount of rigidity to protect their values – so that it’s a question of balance. Goleman emphasizes what distinguishes highly adaptable people in his concluding anecdote. The individual concerned demonstrated a high level of tolerance for risk, ambiguity and stress – combined with a strong confidence in their ability to tackle any challenge that arose. How to become more adaptable? The authors of the various chapters have some great tips, ranging from the better known “Situational Leadership” approach that we teach in our management and leadership courses, to personal and team reflection, and neurological practices. Vanessa Druskat reminds us of the importance of adapting your leadership style to the context. This could be a team that requires a more directive or hands-off approach depending on the situation. It could also be an individual that is in need of more coaching and support, as opposed to delegation and more scope for their initiative. An adaptable leader will be aware of the best style to adopt for the given situation. Ask yourself: “Is there another way… ?”… to do this, to respond etc. By the way there is more about this in booklet number 10: Conflict Management, which is written up in Elisabeth Goodman’s blog Conflict is “the lifeblood of high performing organisations”. The section above on why adaptability is important to the team already references some of the approaches available for teams to carry out self-evaluation. Vanessa Druskat emphasizes the importance of making this a regular formal process for the team, with everyone included, and healthy open communication. We also teach a range of learning approaches for teams in our Project Management, and Knowledge Management courses. Druskat talks about the importance of a positive mindset or “Affirmative Environment” as a team norm. And also a “Pro-active problem solving” team norm. Richard J. Davidson’s chapter on “Training your Brain to be Flexible” has some great insights on the neurological basis for adaptability. A healthy hippocampus will enable us to respond to the different contexts or situations that we find ourselves in at home and at work; when focusing on processes vs. interactions with people; when dealing with stressful situations. It will enhance our adaptability. The hippocampus has a high density of receptors for the stress hormone cortisol. High levels of cortisol can apparently result in cell death and abnormalities, which will negatively impact the performance of the hippocampus and hence that of the other brain regions. A healthy hippocampus is one where there is good cell growth (also referred to as neuroplasticity), and where this new growth is encoded with positive experiences. We can encourage this healthy development through regular aerobic exercise and stress reducing activities. Davidson’s suggestions include walks in nature, petting our pets, acts of kindness to others and meditation. As Goleman and others point out, adaptability also relates to other aspects of emotional and social intelligence such as self-awareness, self-control and a positive outlook. Adaptability relies on openness, flexibility and resilience. People who are adaptable focus on anticipated benefits rather than a fear of the unknown, of pain or of loss. Goleman encourages us to look for role models that we can learn from! Do get in touch if you would like to find out more about RiverRhee, and how we can help you to create exceptional managers and teams.